Across the country, advocates for children with disabilities are grappling with the impact of federal budget cuts to special education programs. Let’s explore the impact and how many young people’s lives are affected. 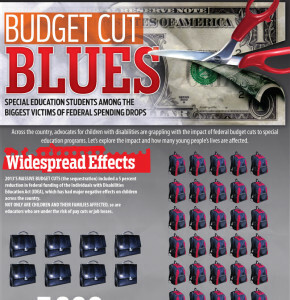 2013’s massive budget cuts (the sequestration) included a 5 percent reduction in federal funding of the Individuals with Disabilities Education Act (IDEA), which has had major negative effects on children across the country. Not only are children and their families affected, so are educators who are under the risk of pay cuts or job losses. Services cut or eliminated for millions of students. Funding for children living in poverty, special education, and Head Start slashed by billions. Decimation of programs for our most vulnerable—homeless students, English language learners and high-poverty, struggling schools. Slashing of financial aid for college students. Loss of tens of thousands of education jobs—at early childhood, elementary, secondary and post-secondary levels. Under the IDEA, the government committed to helping make up the difference in the cost of educating a disabled student and a general student. But it’s never even come close to coming through on that commitment. For millions of students with special needs, these programs have proved crucial to their development and success later in life.